Holiday villa located in the middle of nature, ideal place to spend a few days relaxing and unforgettable holidays. The house is located in the Atalaia farm, next to the Tenagua mountain (Puntallana), a privileged enclave 10 minutes from the capital of the island and 20 from the airport; the house has private parking and access to the common areas of the farm that offer pool, spa and barbecue. 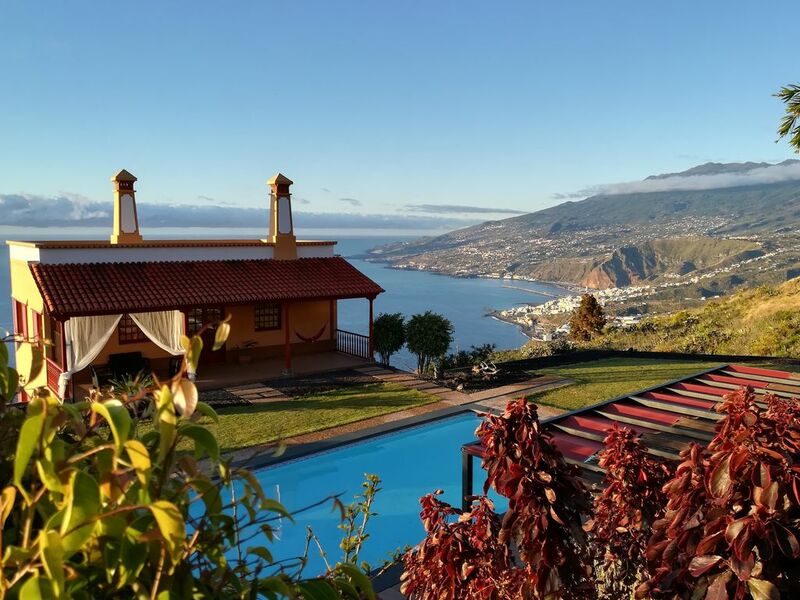 It is a perfect place for families and groups of walkers, who can enjoy a panoramic view of the entire bay of Santa Cruz de La Palma, being able to see the islands of La Gomera and Tenerife, surrounded by large green spaces and gardens. General Description: The house has a total of three bedrooms, two with a double bed and the third with a single bed. All of them have fitted wardrobes. In the house there are 2 bathrooms: one with shower, located on the ground floor; and another with bathtub, scale and hair dryer on the top floor, next to the bedrooms. Also on the ground floor, we find a spacious living room with fireplace and sofas, as well as a hall and a cozy kitchen with extendable wooden table. On the other hand, outside the living room, you can enjoy the wonderful views in the shade of a fantastic wooden pergola, under which we find a set of armchairs, chairs and a table for a meal or outdoor drink. Next to the common area of ​​the pool and spa, there is a porch with a chill-out space to relax in the shelter of the breeze. Entertainment: The property is provided with Spanish TV (Freeview), Chromecast 2. 0 to enjoy all the content of your mobile or Tablet and Internet with WiFi connection (free). In addition, the house has a Newton-type reflector telescope for the enjoyment of night astronomy, one of the great attractions of the island of La Palma. On the other hand, for music lovers, an Epiphone Les Paul electric guitar is available. Equipment: The house provides bed linen and towels. It has a washing machine, iron with its table, radiators and all the necessary utensils for the guest to enjoy a pleasant stay. Kitchen: It is equipped with a gas / electric cooker, oven, microwave, fridge with freezer, toaster, kettle, kitchenware and Nespresso Dolce Gusto coffee machine. Outside: The guest will find outside a pool (10 x 5 m) with lighting. This, in turn, has outdoor showers, as well as a bathroom / walk-in closet. Next to the pool, there is a spa (hot tub at 38 ° C) that can accommodate up to 6 users. The whole stay is equipped with reclining chairs and a pergola covered with set of chairs to relax between bathroom and bathroom. This area of ​​bath and relax is surrounded by natural grass and pavement that combines stone and wood, decorated with small decorative gardens. The property also offers a barbecue with grills, sink and large table where you can enjoy a meal in the middle of the gardens. Play park / folding travel cot available. We had a warm welcome by Octavio. He is a very helpful host with lots of good advices and suggestions. The house is beautiful decorated and everything you need is available. Perfect for a relaxed stay at La Palma. Feld like coming home and certainly a reason for us to visit again. We loved the house and the area of Santa Cruz. The house was in set in a beautiful hillside location with interrupted views of Tenerife and La Gomera. The house has everything you need and was spotless. The pool and outdoor area was also lovely set amongst lemon trees and flowers. Octavio was a great host and it was lovely to meet him. We had amazing walking and seaside swimming. It was a pleasure to host Lynne and family. They loved our place and took good care of it. We're really looking forward to meet them again. Very nice house on a beautiful location! The house has everything you want. Fully equipped and lovely decorated both inside and outside, pool with spa, great view, very fine and quiet location. It was perfect for us, a family of five. The kids loved it. Shops are only a short ride away and Santa Cruz is nearby. The rest of the island was easily reached by car. Communication with Octavio was very easy, helpful and prompt. We certainly recommend this great place! Thank you so much, Paul & family! We were also pleased to host you and hope we meet again in the future; if you're not of the perfect kind of guests, sure you're very close to be!